Wildlife officials expect to build on last year's good season, bolstered by a growing deer population and an increased number of permits. WEST GARDINER — Firearm season for deer hunting opened on a cold Saturday, the start of what state wildlife experts predict could be even better than last year. Maine hunters wasted no time putting their permits to use. Trevor Berry of Farmingdale and his grandfather Charles Berry of West Gardiner found success Saturday morning, with the elder Berry killing a doe in Bowdoinham with a .270-caliber rifle. 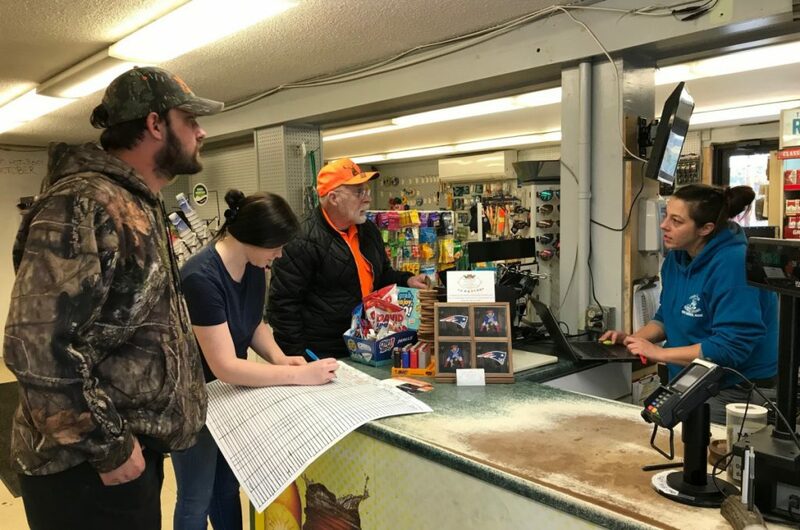 The Berrys took the deer to Four Corners General Store in West Gardiner, one of more than 300 tagging stations across the state. Four Corners General Store employee Dawn Hunt said the Berrys’ deer was the fifth to come in by 10 a.m. Saturday. She estimated there were 12 on opening day last year. Charles Berry, 75, joked with the employees that his deer was 400 pounds but later estimated that it was in the 130-to-140-pound range. Father and son duo Chad and Nick Perry hadn’t had any luck yet Saturday morning, and were at the Four Corners General Store for some food before heading back out to continue hunting. “This is his first full year of hunting,” Chad Perry said of his 10-year-old son, who has been tagging along on hunts since he was able to walk. Officials at the Maine Department of Inland Fisheries & Wildlife expect to build on a good deer season last year, bolstered by a growing population and an increased number of permits. According to the DIFW release, there are more than 215,000 licensed hunters in Maine, and hunting activity supports 3,400 jobs while generating $338 million in revenue. Last year, hunters took home more than 27,000 deer. Available any-deer permits are expected to rise 28 percent from last year’s 66,050 to 84,745 this year. Of the state’s 29 wildlife management districts, permit increases are occurring in nine. While the woods may have been quiet Saturday, Fuller’s Market in West Gardiner certainly wasn’t. Owner Walt Longfellow estimated 10 deer had been tagged at his store by 10:30 a.m. on what he said is usually the biggest day of hunting traffic. The store already had been tagging three or four deer every week since bow hunting season began earlier this fall. While many tagging locations are stores, hunters also can take their deer to the Skowhegan Fire Department. Skowhegan firefighter Daryl Wyman said the station saw a steady stream of hunters, eventually tagging 16 deer by late afternoon. The largest kill was a 250-pound, 12-point buck. The state has touted its new web-based registration system, which replaces old game registration booklets that were kept by hand at tagging stations and shipped to Augusta and the end of the hunting season. “This new system will quickly allow tagging stations and hunters to register their animal, and also provide our biologists and game wardens with real-time harvest data,” DIFW Commissioner Chandler Woodcock said in a Sept. 17 news release announcing the new system’s implementation. Hunters Laura Safford, Chris McKenzie and Neal Parker spend part of opening day each season refueling at High Hat Pancake House. McKenzie said he was undaunted by the unfavorable afternoon forecast. “We ain’t no fair-weather hunters,” he said with a smile.